Our approach is about making learning personal, social, and relevant. One of our best tools for making learning relevant is to create apprenticeships for each Millennium student, where they go to a real workplace after-school or for a special one-week "intersession" to understand how knowledge is applied and created in various professions. The following blog post is one 6th grade student's description of her apprenticeship with an architect, as our first student to begin this program. I had the opportunity to be the first person at Millennium to do an apprenticeship. Before the apprenticeship, all of the students got to visit different businesses to see what different jobs were like. One of the jobs that looked interesting to me was architecture because it sounded fun to design and build buildings and spaces. One of the parents at the school, John Klopf, has an architecture firm and I was able to do an apprenticeship with him at his firm. I went after school two times per week for a month, for a total of eight sessions. My assignment during the apprenticeship was to design a bathroom and model it with TinkerCAD which is a 3D modeling program. John showed me examples of bathrooms and then I came up with several different designs myself. I drew the designs on paper and then picked the one that was my favorite and built the 3D model based on that. TinkerCAD was somewhat hard to use. It was sometimes frustrating when I couldn’t get my designs to come out just right. I finally got more comfortable with TinkerCAD though. 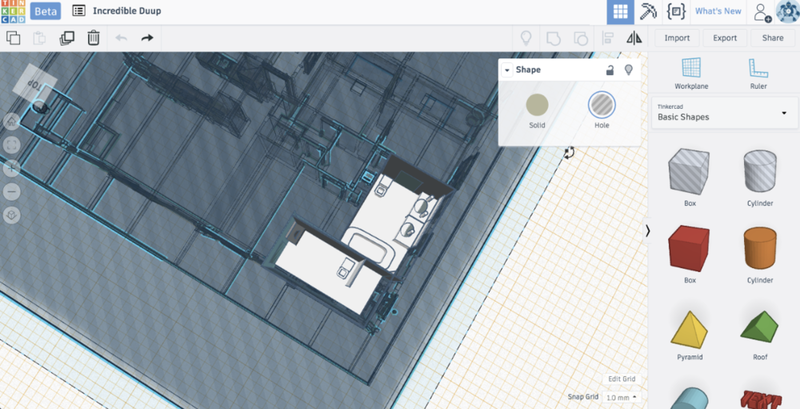 Here is a screenshot of what TinkerCAD looks like. To create the shapes in the bathroom, I would choose one of the shapes you can see on the side of the screen. I would then place it on the screen and adjust the dimensions to match my drawing. During this process I learned to use the symbols that architects use for doorways, windows, walls and more. I had to scale my drawings as well. The scale that I used in my drawings was that ¼ inch equaled a foot. 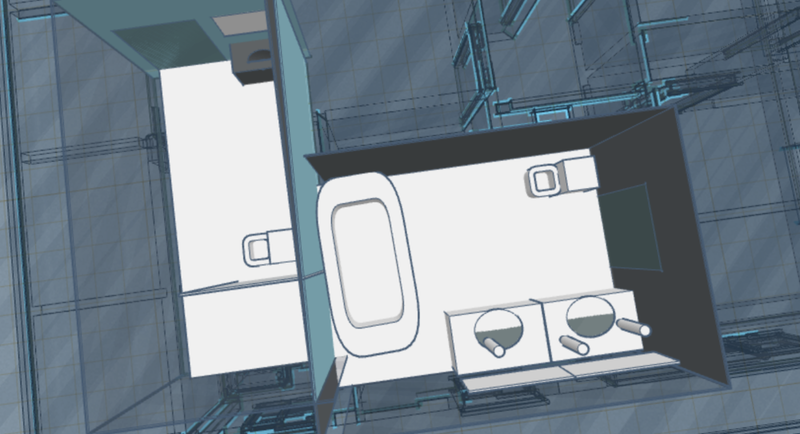 This is a screenshot of the bird’s eye view of the bathroom I designed. The TinkerCAD portion of the project took four or five sessions. I had used TinkerCAD before, so I didn’t have to learn how to use it completely from scratch. I liked doing the apprenticeship. I thought it was fun to design and build a bathroom. John and the people in his office were kind and helpful. One tip I would have for others doing apprenticeships is to make sure to pick something that you’re interested in since you’ll be spending a lot of time on your project. 1. How to be comfortable and communicate with adults I don’t know. 2. What it’s like to work in an office. 3. How to be confident enough to ask questions when i’m stuck. 4. The process involved with designing rooms in buildings. I’m very appreciative that I got to do the apprenticeship because I think the things I learned will be very helpful to me in the future.